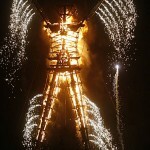 But what you should know, is that underlying all of the fine people, art and music that comprise the festival, there is at the end of the weeklong event a ritual of burning “the man.” I suppose the burn, and the entire event for that matter, is symbolic of whatever you want it to be. But certainly one dominant theme associated with fire and burning is renewal and the idea of shedding, both literally and figuratively, those things you are ready to leave behind. Over the course of the past couple of weeks I’ve been cleaning my garage, part of which has included finally going through the last remnants of a company I once owned, called iAgency. Known non-affectionately around my house as “the iAgency boxes,” they contained a few hundred three ring binders that were the results of our work for clients and literally represented the “early days” of online marketing and public relations. They were the physical representation of years of hard work and dedication by a team of young professionals in the mid-nineties too many to name, but to whom I remain endlessly grateful. While I could not part with a few of the books for some of my favorite campaigns, like our early PR efforts for Zappos.com, creative online community programs for Symantec, my favorite film and television projects for Fox, Paramount, NBC and Imagine Television, the extensive online marketing and PR work we did to launch Warner Bros. Online or the binder for our first clients, Hollywood Online and The Palace — I did undertake a purge that for me was of Burning Man proportions. As I let go of these heavy books representative of a past life, in my heart there was a bitter-sweet feeling of finally moving on combined with pride for all we accomplished from 1995 to 2002 and knowing that all of that experience was invaluable and led me to where I am today. The whole Burning Man thought came as I carted off my last load of notebooks to a neighbor’s dumpster late Sunday night. As the squeaking of my antique dolly filled the quiet street, I found myself wondering what other people ready to move on and clean house may have carted out to the Playa to burn this year — or even what percentage of the people who attend even think of the event in such terms. While I would have of course enjoyed being there for the second time in eight years, I was equally delighted to have in a small way privately shared the experience, knowing that you don’t have to be on the Playa to have Burning Man in your heart. The Los Angeles Business Journal article referenced in my last post came out yesterday and I thought Charles Proctor did a superb job profiling the current state of the technology industry in Los Angeles. The article, entitled “Special Report: Plugged In, Charging Up” goes into great detail comparing employment trends in the technology sector in Los Angeles with that of Silicon Valley, including how our diversified market helped LA recover faster from the dot-com crash and the way aerospace engineers transfered their expertise to industries like computer science and medical devices in the post-Cold War era. It was fun being asked to contribute to this piece, but even more encouraging to read an article with some quantifiable details about how well our local technology community is faring these days. Hats off to Mr. Proctor for his thoughtful, quantitative analysis, and A BIG THANK YOU to Nicole Jordan for the introduction.